We are excited to announce that River Watch Beef is now available for sale at Colonial Gardens, in Blue Springs, Missouri (Kansas City area). Our premium Grass Fed Beef is located in the frozen foods section of their Kansas City-based local foods market. “We’ve had many customers, both in Kansas City as well as folks passing through the area, ask if our beef was available at a local store. 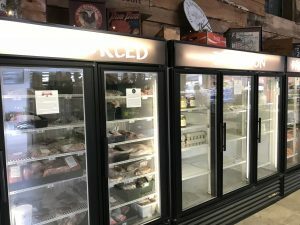 We are happy to report that Colonial Gardens now carries over 10 different cuts of our grass fed beef, plus our new beef jerky.” River Watch Beef was established in 2016 with a goal to raise all-natural, free range beef and make it available to consumers as a healthy alternative to traditional store-bought beef. Located in Blue Springs, Missouri, Colonial Gardens has been serving the Kansas City area for generations. In the Summer of 2018, they opened a new retail storefront with local KC foods, a cafe, an event space and much more. Their history includes being seasoned gardeners, inspiring families & communities to grow together. Colonial Gardens also provides nursery products, landscaping & hardscaping materials for every season. 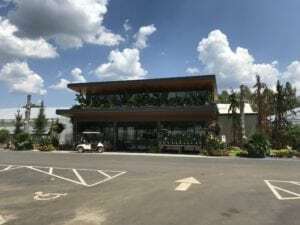 In the spirit of new growth, Colonial Gardens is beginning to plant the seeds of their own future, including growing into an innovative garden center & agri-tourism destination, never before seen in the area. Colonial Gardens carries a wide variety of River Watch Beef cuts, plus all-natural grass fed beef jerky. We current offer two flavors of premium beef jerky at Colonial Gardens: Mild Beef Jerky (4 oz.) and Sweet Peppered Beef Jerky (4 oz). Grass Fed Steaks Available: Filet, KC Strip, Bone-In Ribeye, Sirloin Steak and Flat Iron steak. Other Grass Fed Beef Cuts Available: Hamburger, Minute Steaks, Stew Meat, Short Ribs, Soup Bones, Brisket and Chuck roast. 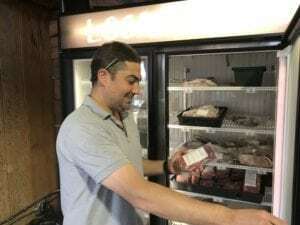 What is Free Range Beef? River Watch Beef produces free range beef. Typically, grass fed beef is free range, meaning animals are free to roam the pasture and are not confined to a large feed yard. Most store-bought beef is raised in large commercial feed yards, with thousands of animals crammed into a cramped feed yard. Animals raised in the free pasture are typically much less stressed than feed yard beef. Happy animals = better food. Grass Fed Beef is a Healthier Option? Grass fed beef refers to beef animals that primarily feed on native and other natural grasses. Most store-bought beef is fed a significant amount of corn, grain, supplements and other additives to artificially ‘fatten’ up the beef. The result is that you are paying for fat and a less-healthy cut of meat. Most folks don’t know that grass fed beef is a healthier option versus store-bought beef. Grass fed beef has about 30-40% less total fat, more antioxidant vitamins (vitamins A, D, E and K), less cholesterol and is rich in Omega-3s. Our beef is 100% all natural and raised with no hormones, GMOs or artificial additives. Join us September 5th, 2018 at Colonial Gardens — we’re grilling up some samples of our beef with live music in the background. We’ll share more information about the event in mid-August.